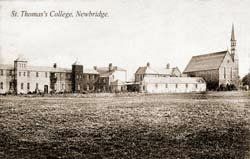 Newbridge College is the school of the Irish Dominicans. It was founded in 1852 and historically is the successor of the Priory of St. Eustace in Naas. In 1852, Fr. Dominic Walker and Fr. Nicholas Freyne established the College in response to the demand for secondary education which was a result of Catholic Emanicipation and which had been so cruelly interrupted by the dark days of the famine. In the first year, the college had an enrolment of 50 students. In 1870, the second church was built and at this time a restriction on the numbers enrolled was imposed. This was lifted in 1894 and the enrolment grew to 100. The College rapidly established itself as one of the leading centres of Irish Catholic education. Indeed in 1901, just fifty years after its foundation, it was described by advanced nationalists as being “wondrously Catholic and Irish”. Some few years later William Bulfin in his classic “Rambles in Erin” (Dublin 1907) said of Newbridge College that it was doing good work for Irish education: “It is an educational institution that does its business on an Irish plan. It is bringing up youths in the knowledge and love of their native land”. In 1924, Junior House was built, complete with Clock Tower. The Past Pupils Union, which has continued down through the years, was established by Dr. JJ Cosgrove in 1937. Not long afterwards, 1941 marked the winning of the Senior Cup by the Senior Cup team who were trained by Fr. Leahy O.P. In 1951, the year after the Junior Cup team had won the Junior Cup Final, the foundation stone for Senior House was laid. 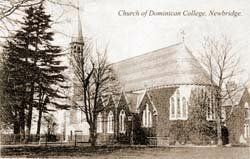 The following year, 1952, was the centenary of the foundation of the College. The event was attended by the President of Ireland, Sean T O’Ceallaigh, the Taoiseach, Eamon de Valera, the Papal Nuncio, the Bishop of Kildare and Leighlin, Dr. Keogh and the Master of the Dominican Order, Fr. Emmanuel Suarez. Construction of Senior House and the kitchen and refectory was completed in 1954. These developments allowed for a very big increase in the number of students, with a corresponding increase in the number of staff. During all these developments the students were encouraged to pursue high levels of academic achievement, with an emphasis on a broad liberal education. By 1956 there were nearly 300 students at the College, of whom 250 were boarders. The 3rd and current church at Newbridge was built in 1966 and this was consecrated by Cardinal Michael Browne OP. Without doubt Rugby was the highlight of year in 1970 as Newbridge College beat Blackrock College in the final of the Senior Cup. Fr. John Heffernan OP was the coach for the team and Mick Quinn led the team as captain. In terms of sports in the College 1980 was another important year. In July of this year work commenced on the construction of a new bridge over the Liffey and allowed the sports pitches to be transferred across the river, with easy access from the quad. 1984 marked a very significant development in the history of the College. The admission of girls into the school took place for the first time. Undoubtedly, this move has been instrumental in establishing the unique atmosphere which prevails in the College to this day where there are approximately 50% female students. The following year responsibility for the management of the College transferred to a Board of Governors. This board was comprised of Dominican Fathers, Parents, Teachers and Past Pupils. In 1986 a leading Irish educationalist wrote of the College, “The Newbridge system seems to work: the pupils pass their examinations, they do well in life, whether in factory, field or the professions. They return willingly to the College – always a good sign – and, in many cases, send their children along as boarders. There is little talk among them of wishing to burn it to the ground, the wish of a not inconsiderable number of people when their old school is mentioned. In fact anyone who lived in the College, as I did, must have left it with regret ”. In 1991, with decreasing numbers of boarding students, Albert’s, Vincent’s and Louis Bertrand’s dormitories were converted into new classrooms and a complete revamp of the science laboratories took place. Indeed from September of 1992, all boarders now lived in Senior House, thus allowing Dominic’s dormitory to be converted into a new corridor of classrooms. At Easter time this year the death occurred of Fr. Henry Flanagan OP. Fr. Henry had been hugely involved in life in the College for many years and was a major influence on the lives of generations of students who passed through Newbridge College. This year also saw the appointment of the first lay Principal of the College, Mr. Patrick O’Mahony. During his time as Principal, Mr. O’Mahony oversaw huge change in the college both academically and in terms of the facilities at the college. He remained as principal until his retirement in 2006. 1992 also saw the end of formal classes on Saturday. In its place, a “Saturday Morning Programme” of activities was instigated, which was compulsory for boarders but optional for day students. Classes in areas ranging from Cooking to Criminology and Psychology to Law were delivered through the programme, giving students the opportunity to explore new subjects outside the standard school curriculum. In April, 1994 the new Gym block, which incorporated a gym, Biology laboratory, Art room and Technology suite, was opened by the Minister for Education, Mrs. Niamh Breathnach TD and blessed by the Bishop of Kildare and Leighlin, most Reverend Laurance Ryan DD. The senior cycle curriculum was expanded this year to include Home Economics and Building Construction. Hockey in the school got a major boost with the construction of an all weather pitch across the river beside the rugby pitches. The difficult decision to phase out boarding in Newbridge College was taken by the Board of Governors in 1998. This would eventually see the college become essentially a day school, with the option however for students to remain on after class for evening tea and study until 9.30pm. Indeed, this year saw the first school Captain who was female and not a boarder – Tara Flanagan. Over the next two years a lot of development work took place in the College, including converting Antonines and Raymonds dormitories to classrooms, complete overhaul of the kitchen and refectory with new outside caterers and refurbishment of the rooms on the Theatre corridor as classrooms. The College celebrated it’s 150th anniversary in 2002, with many activities organised to mark the occasion. Upon the retirement of Mr. Patrick O’Mahony, the college has been led by Mr. Tom Blanche and Mr. Matt O'Shea, the current Principal is Mr. Pat O'Brien. The College at this time has an increased enrolment of approximately 890 students. From small beginnings the College has expanded into the present fine complex of buildings which stand in their own extensive grounds with the Liffey forming the fourth side of the main College Quadrangle.